Days of the Week: Discover which four weekday names that are still in use today have Viking origins. Photo courtesy Royal BC Museum. Vikings: Lives Beyond the Legends has landed at the Royal BC Museum in Victoria, BC. Vancouver Island is the international exhibition's first North American stop and runs through November 11, 2014. The exhibition evolved from recent discoveries and provides insight into the Viking era. 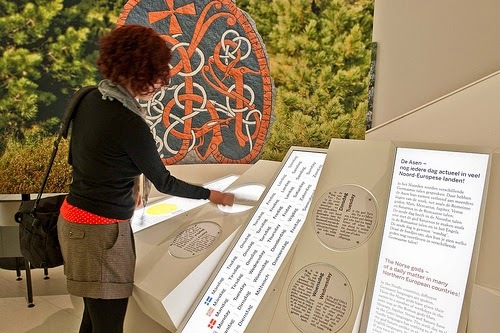 Artifacts, interactive computer displays and hands-on educational activities tell the story of the Viking people, illustrating who they were and how they lived. Vikings: Lives Beyond the Legends challenges commonly held beliefs and misconceptions of this mythical period. It breaks through stereotypes of Vikings as plunderers rampaging across Europe, wielding swords in search of treasures and valuables. The people of what is today Denmark, Sweden, Norway, northern Germany and parts of Finland lived mainly off the land. They were farmers and fishermen, and the myth of horned helmets was invented in modern times. SHM 34000:Bj 660 (FID 108914). 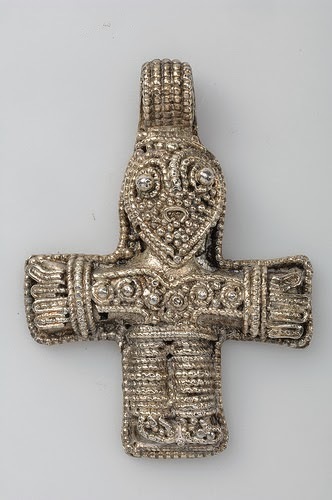 The exhibition, produced by the Swedish History Museum in Stockholm and MuseumsPartner in Innsbruck, Austria, features more than 500 rare artifacts and original archaeological objects from the 8th-11th centuries. They include jewelry, swords, axes and clothing -- many have never been displayed outside Scandinavia. The objects provide glimpses into domestic life at that time: family and community, religion and rituals, travel and trade aristocracy and slavery and Viking women. The exhibition provides insights into the significance of the Vikings' craft, the power of their mythology and the symbolism of their ships. Scandinavian Settlement and Viking Activity: Though the word 'viking' appears in Old Norse sources, it's mainly used to describe an activity. Men and women went 'on a viking' -- a commercial trip or raid. People seem to have referred to themselves as a Viking only when involved in this activity. 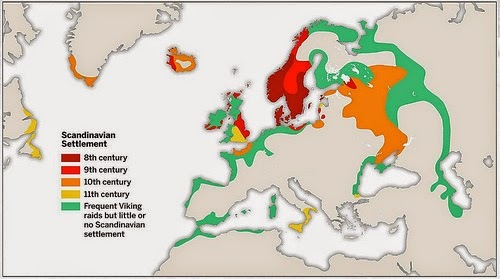 This map shows the wide extent of Viking activity and Scandinavian settlement across Europe and the North Atlantics from the 8th-11th centuries. Image courtesy Swedish History Museum in Stockholm. The six-month exhibition in Victoria, which opened in May, includes numerous activities for all ages. Among the youth oriented programs are Saturday Night Alive and Vikings Summer Camps. A complete schedule may be found on the Royal BC Museum website. IMAX Victoria, located in the Royal BC Museum, is screening a companion film to the exhibition, Vikings: Journey to the New Worlds. The 40-minute large-format documentary provides a comprehensive snapshot of the Vikings, their historical and cultural impact, as well as scientific and technological achievements. Special Royal BC Museum and IMAX combo pricing is available. Tickets for Vikings: Lives Beyond the Legends are available online or at the Royal BC Museum Box Office. Call 888.447.7977 for more information. The Royal BC Museum, located near the BC Parliament Buildings and The Fairmont Empress, is open daily from 10-5. Extended summer hours are 10-10 on Fridays and Saturdays through September 27, 2014.